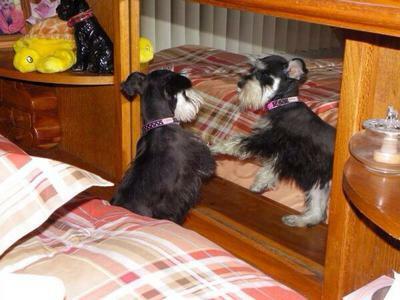 Kandi is a typical schnauzer. She is very special as she is small and has such a funny way in humor. She is four years old, 7lbs and her big brother Lil'Sun is eight and 9lbs. Kandi's way to have fun is getting into the Kleenex boxes if you make mistake of leaving one out top of box. Her other favor thing is stealing socks and hope I will try to catch her. In fact any thing she can find on tables or sofa she hides under cushions. She is a mountain goat walks on top anything she can jump up on. She is very independent and does what you tell her not to do and does what she wants and gets away with it. Good thing my Giant wasn't like her! She loves her toys and her favorite is her stringy bone loves to have thrown and hide so she has to find. She has lots of toys left from my Giant that loved and took care of his toys. She has a new attraction my daughter moved in with her mini schnauzer and her cat. Kandi don't like other dogs or cats, but now she has a new toy the Cat! She is infatuated with the cat. Instead of sleeping with Lil'Sun and Mom & Dad she sleeps with my daughter and her mini so she can watch the cat all night. Kandi is one of a kind. She has personality, funny, loveable, her Dad's left leg warmer (Lil'Sun is right leg warmer) and sneaky. She is very cute! They both are! I have 2 also. Mali is a toy at 9lbs. (Liver pepper) and Demi Shae is a teacup at 6lbs. (Liver Party). 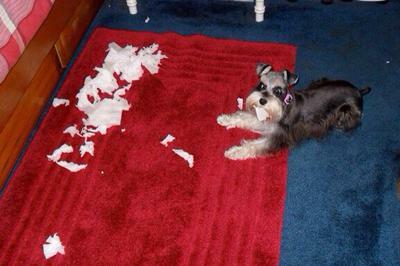 I love your pic with the toilet paper because with all the schnauzers I have owned over the years this is definitely a schnauzer addiction! I just looked under my bed the other night because Demi was acting like there was a mouse or something under the bed,,,so I look and it is Mali staring back at me with a mouth full of tissue! Demi was trying to tell me what her sis was doing! So cute,,,just like kiddos! 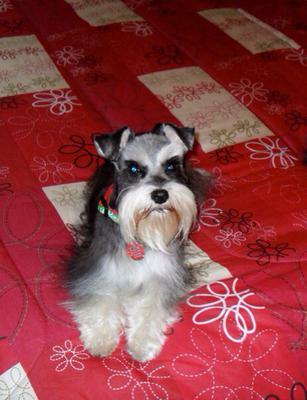 Schnauzers are my addiction! Love them! She's so cute...My mini Charlie stays mad at us for at least a day when he gets groomed as well. Too funny. I remember when you first got her...she was an adorable puppy and I've watched her grow up via your photos and your stories of her. She's just a great little girl with so much spirit and humor. She came into your life at a perfect time and with her cute and lovable ways she turned your life around. She's a remarkable little one and you're very lucky to have her. She's so beautiful. So pretty and personality plus! Your Mom is one lucky lady! 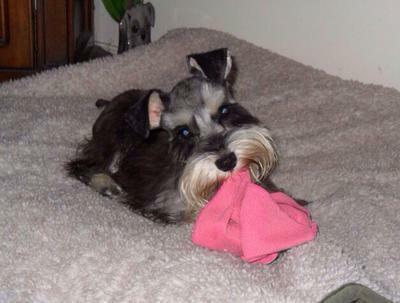 Return to 2014 Schnauzer Photo Contest.